Standard Kolate is a six-membered ring consisting of alternating aluminum and oxygen atoms. One molecule isopropyl alcohol is attached to each aluminum atom. In theory, in the first step of the reaction, the fatty acid replaces each alcohol on the ring to form a cyclized aluminum monostearate. This takes place at about 100°C. 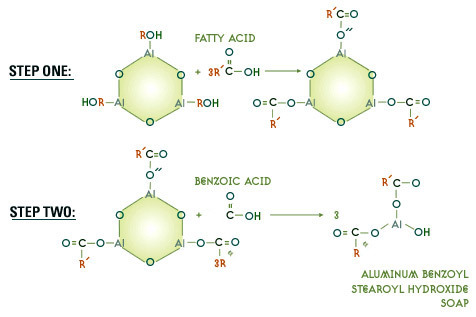 As the temperature increases, the second step begins in which the benzoic acid breaks the ring into three separate molecules of the soap, the aluminum benzoyl, stearoyl hydroxide. This reaction should take place at atmospheric pressure in order to minimize ester formation. With the Kolate 6030, enough of the acid requirement is already in place to eliminate the release of alcohol and it is only necessary to introduce the balance of the acids required for a specific formulation. The facts and recomendations made herein are based on our research and the research of others, and while they are believed to be accurate, they are intended for use by skilled persons at their own risk. We assume no liability for the events resulting or damages incurred from the use of this information. Statements concerning the possible use of our products are not intended as recommendations to use them in the infringement of any patent.